Back in Henry's day, the beer game was simple: craft good ingredients into quality products. Today, we swim in an ocean of great beer. Ultra hoppy IPAs. Stouts aged in whiskey barrels. Beers that force experts to debate what exactly defines beer. And while some breweries are focused on pushing boundaries, we're serving up rock solid, uncomplicated beers that are textbook examples of their style. Because that's what we're all about. Making good beer easy - to try, share and eventually love. Know what you and beer both have in common? Besides being great at backyard barbecues, you're also both about 90% water. You need good water to make good beer. So that's the only kind we use. Barley is a cereal grain which, believe it or not, is mostly made of natural sugars. Sugars are what yeast like to munch on most. We give them a steady supply of sugar, and in return they give us (and you) delicious beer. Hops are what make beer bitter. And that's actually a good thing, because not only do they balance out the sweetness of the barley, they also add a ton of the flavor and aroma that makes beer so great. Yeast cells may be small, but they're a big part of brewing beer. They turn sugars into alcohol and carbon dioxide. Without yeast, beer just wouldn't be beer. 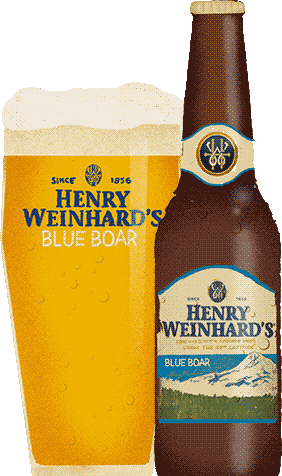 An American Pale Lager, Henry Weinhard's Private Reserve blends Henry's German heritage with the natural ingredients of the Pacific Northwest. If you want to impress your friends, you can say it's brewed with 100% Cascade hops specially grown in Oregon. But all you really need to know is that it's crisp, clean and one helluva beer.